TRI Director Laura James, M.D., speaks to researchers at a recent TRI Open House. Oct. 11, 2017 | Oct. 11, 2017 | The UAMS Translational Research Institute has received funding for a Clinical and Translational Science Award (CTSA) totaling $3,497,558 through Aug. 31, 2018. The 11 months of funding comes from the National Center for Advancing Translational Sciences (NCATS) of the National Institutes of Health (NIH). 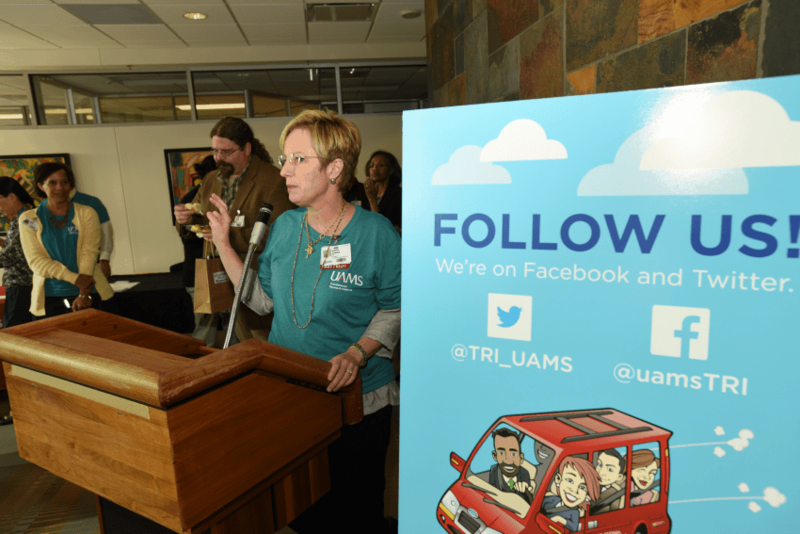 It will enable UAMS to continue its mission of accelerating scientific discovery with innovative programs that help researchers translate their findings into new knowledge and treatments, said Translational Research Institute Director Laura James, M.D., UAMS associate vice chancellor for clinical and translational research. The Translational Research Institute will apply for five years of CTSA funding in May 2018. If the May application is fully funded, the award would likely total more than $25 million. The first CTSA grant was awarded to UAMS in 2009. Receipt of the $3.5 million award ensures that UAMS remains a member of the national CTSA consortium, made up of 62 academic research institutions across the country. As a CTSA-funded site, UAMS directly helps researchers overcome long-standing obstacles to their work and provides patients tremendous opportunities to participate in cutting-edge clinical trials, in which they receive new medications and/or benefit from new treatments that are not available commercially. In addition, UAMS will continue to harness extremely large data sets, in concert with other institutions, to develop state-of-the-art solutions to health challenges. For example, these types of studies allow UAMS to use available data to understand if one treatment is better than another treatment for complex health care problems, such as mental illness, diabetes and other diseases that are common in Arkansas. ARresearch.org, a volunteer research participant registry and website, was established in collaboration with lay members of the community so that researchers have access to a pool of over 3,600 individuals who have indicated an interest in hearing more about research volunteer opportunities. Arkansas Clinical Data Repository, a research data warehouse with de-identified patient data that researchers can use to understand patterns in data that will provide a framework to guide future studies testing new research treatments or approaches. UAMS Profiles, an online researcher-to-researcher networking/collaboration tool, which gives researchers a user-friendly way to locate potential research partners locally and nationally. TRI Portal, a cost-saving electronic request system for researchers, which allows the researcher to select from a menu of over 30 unique services and receive customized help with a research-related task in an efficient manner. TRI’s Community Advisory Board, a diverse board whose members represent multiple grassroots segments of the state’s population. The board provides critical viewpoints, including their cultural and logistical perspectives that researchers need to make their studies operational. TRI’s Community Scientist Academy, which teaches the public how research is conducted and provides readiness training so that community members can serve as consultants to researchers and help plan the design and tools used in the research. Additional components of the new CTSA award include funds to start a new informatics research consultation service, a new research subject recruitment program, and statistical services to ensure studies are properly designed to answer research questions. Other new programs that will be provided by the grant are dissemination services, so that the findings of research studies are communicated to numerous audiences, including research participants, the local community, other researchers, treating physicians and national audiences. The NCATS/NIH award is under Award Number U54TR001629.